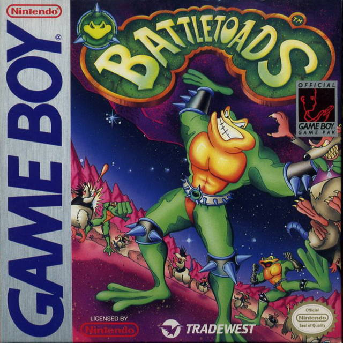 Battletoads for the Game Boy is a unique 'Toads game that takes the basic gameplay mechanics from the NES original and creates entirely new enemies, stages, and bosses. Like other games in the series, it has very little pure brawler gameplay and instead focuses on variety sections such as action-platformer stages and space shootin'. ENTER MY DARKNESSSSS IF YOU DARE! THERE ARE THINGS IN HERE THAT'LL SLICE, DICE AN' ICE YA!! OK ZITZ! GET ON DOWN AND GET READY TO RUMBLE! AT THE END IT'S A SLAUGHTER! Despite the title, this is actually an original Battletoads game. Ironically, Battletoads in Ragnarok's World is a straight port of the original NES Battletoads. This is the only Battletoads game with a horizontally-scrolling space shooter section. 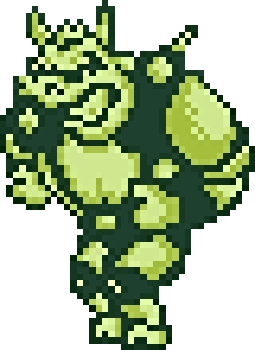 Battletoads is a decent Game Boy game that captures the spirit of the original 'Toads game while adding completely new stages. It's nowhere near as hard or long as the original, but it's got some fresh new gimmicks. Its graphics are alright and its music is fairly catchy. It should also be noted it has very little actual brawlin'.